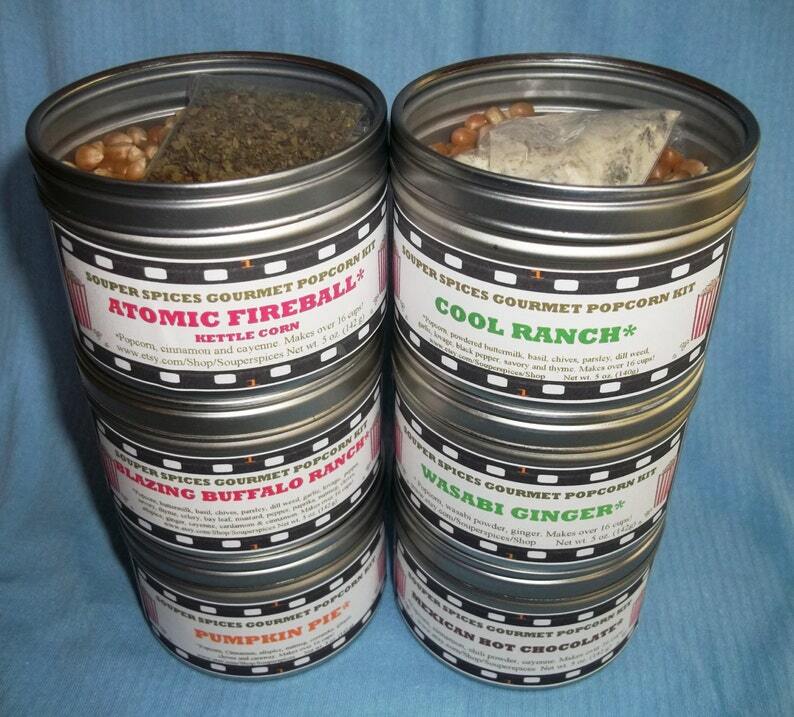 Souper Spices Gourmet Popcorn Kit (5 FULL OUNCES) comes all complete with my Souper Spices salt free, all natural, mouthwatering, gourmet blend of herbs and spices AND Carnival King Extra Large Mushroom Popcorn Kernels with enough popcorn, in each, to make over 20 cups all nestled in 5 oz 3 X 3" reusable tins. **Complete recipes** are included for snack size, medium and party sizes. makes enough for a party or, maybe you just want a snack! THREE NEW FLAVORS! Dill Pickle, Herbes de Provence and Pizza! Cool Ranch Popcorn- Buttermilk, basil, chives, parsley, dill weed, garlic, lovage, pepper, savory, thyme. Dill Pickle Popcorn-Coriander, dill weed, mustard seed, garlic and onion granules, dill seed and vinegar. Try adding crushed potato chips! Try adding crumbly bleu cheese! North Carolina Barbecue Popcorn-Cumin, chili powder, paprika, garlic. Once the kernels have popped, add the rest of the kernels, replace the lid, and give the pot a swirl to coat the kernels in the hot oil. Wait for the kernels to begin to pop. You can swirl again to redistribute the hot oil, if needed. Once the kernels begin to pop rapidly, crack the lid a little bit to allow excess steam to escape. Make sure it's only open a little to avoid popcorn projectiles. When the popping slows to a few seconds between pops, turn off the heat. Wait a couple of seconds for the last few pops, then remove the lid and season the popcorn. These are so cute for teacher gifts!